After his victories in Italy General Napoleon Bonaparte was asked by the French government to attack Great Britain, but with British control of the seas he chose instead to attack Egypt as a stepping stone to the prized British possession of India. The campaign in Egypt - then part of the Ottoman Empire - took three years and involved the kind of horrors from heat, flies and disease that any student of military history will find very familiar. Horses are not ideal animals in this environment, and on 9th January 1799 the French raised the Régiment des Dromedaires, which was initially made up of two squadrons (around 500 men) taken from infantry grenadiers. They rode camels and acted as mounted infantry, patrolling and escorting columns, and were particularly useful in pursuing attackers before dismounting to fight. Such an unusual unit has attracted much interest over the years but this is the first time they have been depicted in our hobby. Their role as mounted infantry is reflected in the mix of mounted and dismounted poses in this set, which offers quite a few of both. Three of the dismounted poses are fairly standard battle poses, while the middle figure seems to be holding the rein of his mount. The last figure in the row is more difficult to explain, and we shall come back to him shortly. For the rest however we liked the poses. By rights the mounted poses should be either fairly relaxed (that is, on guard duty) or involved in a chase, although all of these have weapons drawn as if they are going to use them while still mounted (it must be difficult to disembark from a camel while holding a musket). The swordsman in particular looks like he is expecting to reach someone with his weapon, although that would be pretty unlikely. 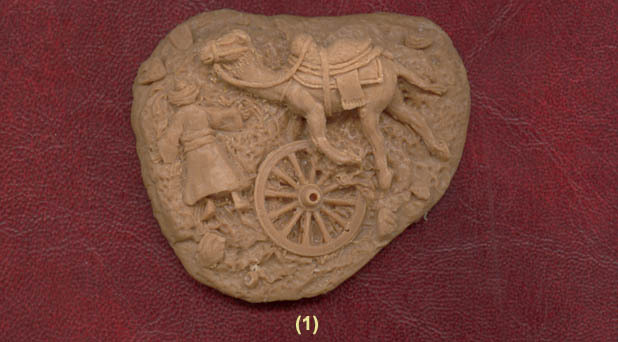 The last figure looks to be an officer, and could easily pass as the 'Little Corporal' himself as Napoleon certainly did ride a camel on occasion. The dress of these men is a complicated subject as it changed frequently during their short time in existence, and inevitably difficulties of supply and an individual desire for more comfort and utility meant this was a particularly motley collection of soldiers. The uniform was broadly hussar in style, and has been well done here. Headgear was initially a turban, then a turbanised shako and finally a shako, while a bicorn was worn for undress, so the presence of all these here is quite correct. The rider with his head and face covered is particularly good, since while this may not have been uniform it is easy to imagine a soldier adopting such a practical garb, particularly in a sand storm. The kneeling firing pose seems to be wearing a full-dress uniform, which while correctly done would seem very unlikely to appear while in action, so we would have preferred that he be much more 'gone native' (although certainly a tempting subject for painting). The figure with the spear seems to have gone very native indeed. We say this because he sports a turban with a splendid plume of feathers which gives him the appearance of a sheikh or an Indian maharaja. This seems a bit over the top, although perhaps more unusual than unlikely. These men were originally issued a sword, pistols and a lance. The lance was soon replaced with a musket with bayonet attached, so all the figures in this set are correctly armed. All the camels have the brace of pistols in a holster on the side not pictured above, so everything is correct here. The sculpting is pretty good, with nice detail and no flash anywhere. Proportions are not always what we would like (some arms are rather short and squat), but these are generally pleasing to the eye. Not everything is original here (the camels are taken from others' output, and are not good examples of the species), but it all works well together, and that includes the riders, which fit their mounts pretty well. The plastic is fairly fragile (bits can get broken in the box), but not nearly as bad as earlier output from this company. The extra piece pictured above is essentially a large scenic base with what seems to be a dead Turk next to an equally inanimate camel - not a highlight of the set but of some value nonetheless. Also included are a couple of paper flags (of a design not generally seen in the army until 1812, but we could not find evidence of what flag, if any, this unit carried). This is an attractive set for a campaign that has received scant attention up to now, but as it is a limited edition we imagine it will become hard to find fairly quickly.